Kevin and I met through an internet dating site about 6 and a half years ago.&bsp; This was when internet dating was still seen as kind of weird and only for geeks and nerds.&bsp; Which suited us fine, because we're a couple of geeks ourselves&bsp; :)&bsp; We bonded over our shared geekiness and our love of food (my love of cooking food and his love of eating my cooking! ).&bsp; We love exploring new restaurants and new cuisines, and then trying to recreate those meals in our own kitchen. um...sorry, got distracted there for a moment! So clearly size was never an issue for us.&bsp; We've had some discussions over the past year about getting healthier - like being more active, and cooking better rounded meals.&bsp; But that is more about being healthier overall, not about losing weight. 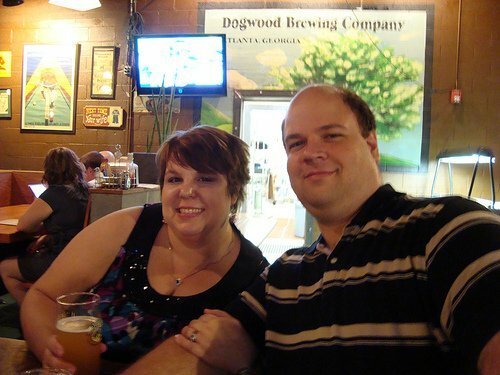 Kevin and I got married on October 7, 2006, and we couldn't be happier!